This is the largest form of protection that we are to wear, not carry. It is placed tight up against the body, form fitted to move easily with the body but with the very critical role of making sure that if we allow something past the sword and shield (skill items) that the wrapped around solid piece full covering breastplate will be the greatest and last line of defense. Righteousness – ˈthe quality of being morally right or justifiable. God created us for righteousness, for goodness, for love. We are designed by the greatest Creator for great things. We must get our heart right with God. I don’t think the order of the Armor is a mistake either. First was to point out who our true enemy is and his tactics of Spiritual Warfare, then we are to Gird our Loins with the truth of believing who we are in Christ and what He is doing in our lives. Once we have identified the enemy and are gaining a clearer understanding of who God is, and who we are; it is now time to get our actions and behaviors aligned with God. Righteousness is where the first true test of Free Will comes in to play in our lives. We have a choice with everything thing we do, from the food we eat, the type of employee we are for our bosses, the types of friends we hang out with, the words that come out of our mouths, the way we drive, the way we parent, the very meditations of our hearts. The rub here however as I see it is that I desired and tried to be righteous my whole life and was rarely successful at best. I used to think of myself as a “good person” but as the bible tells us, none are good. The Apostle Paul sums up our dilemma here perfectly, to desire righteousness but be unable to carry that out. As long as we are on this side of Glory, our sin nature will always be calling to us like a siren song, beckoning us through temptations, fear, pride, lusts, ungodly desires. And as is so plain to see, the world is embracing those desires, feeding them, profiting off them. The giant corporate machine of materialism and wealth could care or less if you get cancer using their products, or get diabetes, high cholesterol and stroke, or crash into a tree, or go bankrupt, or, or, or…. The world is craving more of everything at the expense of everyone else. It is a mindset of consumption and depletion. But that is not our way any longer. We must be intentional in our battle to be different than the world, transformed, renewed. Righteousness will never be something we will attain on our own, it is only God in us and through us who will change our hearts, fill us with purpose, passion, compassion, courage and love. We simply need to reach into the wellspring of life in the arms of our Father in heaven, to seek His Spirit, His Righteousness, His Holiness, for it is only He who Justifies. His blood, His death, His resurrection is what makes us righteous. 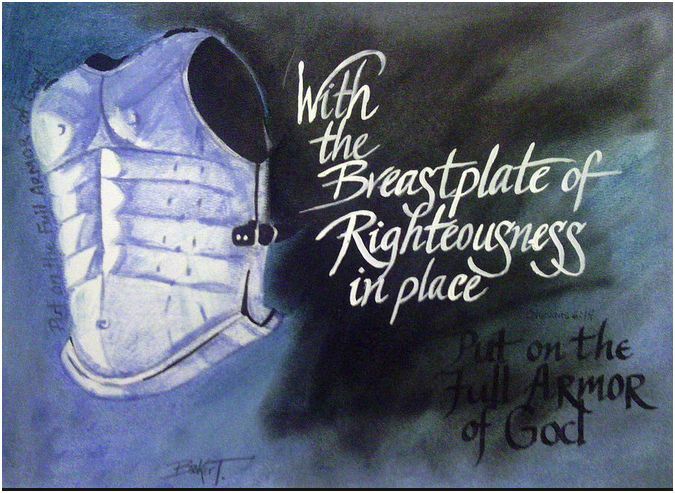 This entry was posted in Armor of God, bible study, encouragement, faith, hope, Jesus, love, Series, The Cross and tagged Breastplate of Righteousness, Ephesians 6, Free Will, God's will, justification. Bookmark the permalink.